Bring out your dog's inner athlete. Every active canine, agility star, weekend hiker, running companion, or couch potato will benefit from a regular strength, endurance, and stretching routine. Sport Dog training is for active dogs and humans looking to improve their dog's body awareness, strength or flexibility. We do a variety skills on balance balls & disks, working every part of the dog's body and giving them a good workout. 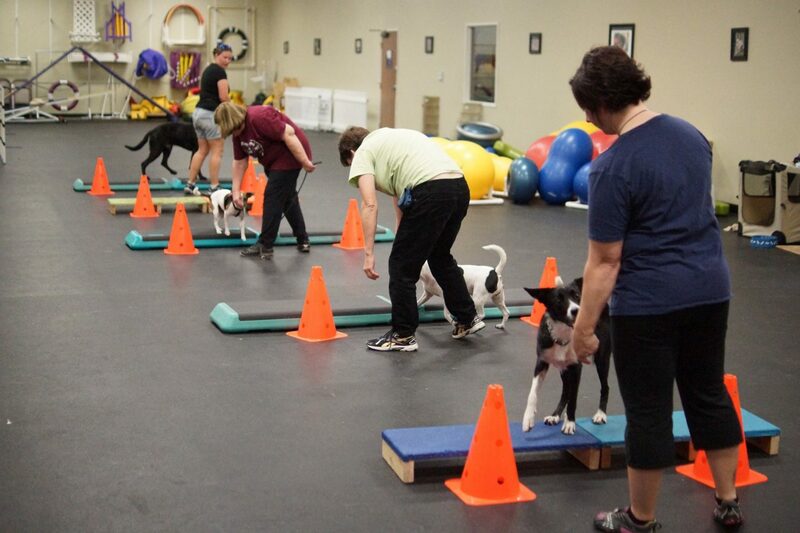 We include crawling, balancing, cone work, backing up all on Fit Paws Equipment. Our Program is loosely based on exercises from Bobbie Lyons. Great start for performance sports teams. These sports include Agility, K9 Nose Work, flyball, competition obedience, rally obedience, lure coursing, dock diving, or herding. Each series is adjusted and individualized for the group in the class. Our keen eye is watching for dogs that struggle and will adjust the exercises accordingly. Classes are 6 weeks long, $150. This class is a series, not drop in like our regular puppy classes. This class IS available for the Training For Life Program. Our Sport Dog Series includes three levels.